Each polling place has a Chief Inspector, at least one Deputy Inspector, and at least 2 Clerks. This guide explains their duties. Pick up a red Chief bag at the training class. This bag contains: a black Accuvote bag, Polling Place Accessibility Supply bag, and other supplies you will need. Do not open the sealed portion of the Accuvote bag until Election Day. Use the inventory list in the red bag to make sure your red bag has all the supplies you need. Call your polling place contact (listed on your supply receipt) to make sure you can get into the polling place on Election Day by 6:30 a.m., or earlier. Important! Take this person’s contact info with you on Election Day in case you have any problems getting in. Call your Deputy Inspector(s) to tell them what time to meet you at the polling place on Election Day. Charge your county-issued cell phone. Use the inventory list in the black ballot box to make sure you have all the supplies you need. Pick up a black Deputy bag at the training class. This bag contains: Ballots, Roster, Street Indexes and other supplies you will need. Use the inventory list in the black bag to make sure your black bag has all the supplies you need. Open your ballot container(s) and count your ballots to make sure the number on the outside label of each ballot container corresponds to the number of ballots on your ballot supply receipt. Write the number of Accuvote ballots that you received on the Ballot Statement, on the front cover of the Roster, Line 1A. Write the number of Automark ballots that you received on the Ballot Statement, Line 1B. ID tag inside the transparent pouches on the front and side of your black bag. Compare the ballot type (BT) on the Accuvote ballots and Automark ballots, and Voter Information Pamphlets to make sure they match. You may receive a Vote-by-Mail Voter List by the Monday before Election Day. If you do, you must update the Roster. Mark “VBM” in red pencil in the Remarks column of the Roster next to the names of all voters whose names are on the Vote-by-Mail Voter List. You may receive a Supplemental List of Voters by the Monday before Election Day. If you do, look for each voter’s name on the Supplemental List in the Roster. If you find the voter’s name, write “SUP” in the Remarks column next to his/her name. Staple this List to the blank page at the front of the Roster, after the cover page. If you receive a Supplemental List, you will also get 2 identical Supplemental Street Index pages. They are to be stapled to the last page of each Street Index. Call the clerks to ask them to be at the polling place by 6:30 a.m. election day, or earlier if needed. Take red Chief bag to polling place. Arrive by 6:30 a.m., or earlier if needed. Remove all supplies from the ballot box and set them aside. Use the black rubber-edged key on the red wrist strap to open the ballot box. Make sure the ballot box is empty. The other poll worker writes his/her initials, too. Break the seal to open the lock on the bag. Take the Accuvote scanner out of the bag. Inspect the seals on the front and sides. Important! If any seal is broken, call the Elections office immediately. Follow the Accuvote Instructions for Opening on the laminated sheet inside Chief Bag #1 to prepare the Accuvote scanner. Follow the Automark Instructions for Opening on the laminated sheet inside the Automark case to prepare the Automark voting machine. Have each poll worker take the Oath of Allegiance and sign the Oath page of the Roster. Each poll worker must sign that page. If your polling place has two or more precincts, station a clerk near the door to direct voters to their correct voting table. Set up voting room so all poll workers can clearly see the ballot box and voting booths. Follow the instructions in the blue binder inside the Polling Place Accessibility Supply bag to set up supplies, and check if accessibility equipment was installed by our movers. If so, verify that it was done correctly to accommodate voters with disabilities. Turn on your county-issued cell phone. Take black Deputy bag to polling place. Arrive at 6:30 a.m., or earlier if needed. Help the Chief Inspector set up the polling place. Give name tags to all poll workers. Ask any poll workers who speak Spanish or Vietnamese to write the non-English language spoken in the text of that language under their name on their name tag. Tell your Chief if either language is spoken by poll workers. The Chief will write the alternate languages spoken on the Welcome sign posted near the voting room entrance. Make sure all poll workers sign the Oath & Stipend page in the Roster. 2 (15-minute to ½ hour) breaks. No breaks after 5 p.m.
Help voters sign in on the Roster. Maintain the inside Street Index. Update the outside Street Index every hour from 8 a.m. up to and including 6 p.m.
Hand out ballots and secrecy folders. Show new voters how to mark a ballot. Use the Street Guide to find their correct polling place. Help the Deputy Inspector with the Ballot Statement on the Roster cover. Help Chief Inspector and Deputy Inspector set up and break down the polling place. The Chief Inspector may ask a clerk to help deliver the red bag and Accuvote scanner to the receiving center. Make sure that your Clerks follow instructions throughout the day. Place voting booths so voters have maximum privacy when voting. Remove any trip hazards like throw rugs. Keep floors dry and keep doors unlocked. Display the flag outside where it’s visible to voters as they approach the polls. The stars of the flag must appear in the upper left corner as voters approach the entrance to the polling place. Note: If your polling place has two or more precincts, keep the ballots behind your voting table so they don’t get mixed up with the ballots from other voting precincts. *If the side compartment of the black ballot box is full, use the blue VBM ballot box for VBM ballots, provisional ballots, voted uncounted Accuvote ballots, and voted Automark ballots. Voters with disabilities and elderly voters may use the accessible voting booth. Others may use it too, if it is available. 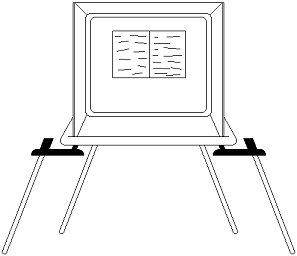 A clear floor space of 30” X 48” is required by a person in a wheelchair for either a forward or parallel approach to the accessible voting booth. To set up (and pack): Attach the black leg extenders and extend the legs to the side for wheelchair access. At the end of the day, remove the legs and store with the extenders in the case. NOTE: Many voters with disabilities have difficulty standing in line for any length of time. Poll workers may need to help keep their place in line if necessary. Also, if a voter asks to use a chair, poll workers should provide one. Show the first voter the Accuvote display screen that shows a zero total. Help voters put their ballots into the Accuvote scanner, and help voters use the Automark as needed. Oversee voter traffic, so that voters form one line, and will know where to go. Keep an eye on the Accuvote scanner and Automark machine to make sure they are working. Make sure the ballot box remains in plain view. Check the voting booths throughout the day. Throw out any campaign literature that voters may have left. Help the Deputy Inspector(s), as needed. They may need you to explain provisional voting, or cover them for breaks. At 7:00 a.m., if a poll worker is missing, follow instructions on pg. 1 of the What to do if guide. Help the Clerks process the voters. Help the Chief Inspector, as needed. Remind the poll workers of the rules below. Anyone may observe the voting process, including opening and closing the polls. Poll workers must cooperate with poll watchers, unless it interferes with voting or opening/ closing processes. Anyone may look at the Roster, unless it is being used. Only 1 person may go into a voting booth. Exceptions: A voter with a disability or a voter who needs language assistance may ask up to 2 people for help. See page 10 of the What to do if… guide. Voters may take their children with them. If there is a line, voters can have no more than 10 minutes in a voting booth. There must be at least 3 poll workers in the polling place at all times. No food or drink on the voting table. Children are not allowed to sit at the voting table. Take any breaks after 5 p.m. until closing time. Talk about politics, or talk excessively while voters are voting. Newspapers, radios, TVs or campaign literature are not allowed in the polling place. No campaigning or petition signing within 100 feet of the polls. No exit polling within 25 feet of the polls. Use of Cell phones / Cameras - To preserve privacy, secrecy and quiet at the polls, talking on cell phones is prohibited. No photography or videography is allowed inside or out of the polling place. Voters may take photos of their ballot (a “ballot selfie”) and share it on social media. Poll workers need to make sure “ballot selfies” don’t cause a disruption at the polls. Voters may use their smart phones in the voting booth as a voting aid. Credentialed media may take photos or videos at the polls if it doesn’t interfere with voting or compromise voters’ privacy. At the Door: If your polling place covers two or more precincts, station a clerk at the door with the Polling Place Table Guide to direct voters to the correct voting table. The clerk can also use the Countywide Street Guide to help voters find their correct polling place. Ask for the voter’s name and address. Find the voter’s name in the Roster. Turn the Roster right side up for the voter, and ask the voter to sign next to his/her name. Tell the Street Index Clerk the voter’s cross reference number printed to the left of the voter’s name. Cross off a tally number on the Tally Sheet #1 for each voter who signs the Roster. Ask the provisional voter to sign the pink Log of Provisional Voters in the Roster. The voter must not sign any other part of the Roster. Do not cross out a tally number for provisional voters. Find voter’s cross reference number on the Street Index. Draw a line through the name of each voter on the Street Index who signs the Roster. Do not cross off a tally number for provisional voters. Do not line through provisional voters’ name on Street Index. Show new voters how to mark a ballot, using a demonstration ballot, and how to use a secrecy folder. Take one ballot at a time from ballot pad. Tear off the voter stub from the ballot and give it to voter with a: ballot, felt tip pen, and secrecy folder. Give provisional voter a ballot and a provisional envelope, and direct to voting booth. Voters with physical or vision disabilities may want to use the Automark device. Write precinct number on Automark envelope. Give Automark ballot and Automark envelope to voter. Ask Chief Inspector to explain the Automark device to voter. After voting, voter puts his/her ballot in Automark envelope, seals envelope, and drops it in side slot of ballot box. Give provisional voter an Automark ballot and a provisional envelope instead of Automark envelope, and direct to voting booth. Voter goes to voting booth. Voter or poll worker inserts ballot into Accuvote scanner on the ballot box. Voter or poll worker inserts provisional envelope into side slot of the ballot box. * The surrendered ballot is the VBM ballot that the voter wants to exchange for a polling place ballot. Write-in candidates Keep list of qualified write-in candidates (if any) at the voting table. You may share it with any voter who asks for it. A voter has died A voter may tell you that another voter has died. On the Notes About Voter Changes page of the Roster, under the heading “Deceased Voters”: Write the name and address of the deceased voter in the left column. Ask the person notifying of the deceased to print and sign his/her name and write his/her relationship to the deceased in the right column. A voter’s name is not spelled correctly On the Notes About Voter Changes page of the Roster, under the heading “Voters with Misspelled Name“: Write the name misspelled as shown in the Roster and voter’s address in the left column. Write correct spelling of name in the right column. Voter’s name is listed twice On the Notes About Voter Changes page of the Roster, under the heading “Voters with Duplicate Names in Roster”: Write the name misspelled as shown in Roster and voter’s address in the left column. Write correct spelling of name in the right column. A voter has moved On the Notes About Voter Changes page of the Roster, under the heading “Voters who have Moved”: Write the name and address as shown in Roster in the left column. Write new address in the right column. A voter changed his/her name Ask the voter to fill out a new Voter Registration form. Ask voter to sign Roster with old name and new name in parenthesis (). See the What to do if… guide for more info. Voter’s name is on the Supplemental List Ask the voter to sign next to his/her name on the Supplemental List. See p. 2 of the What to do if… guide for more info. Voter’s name not on Roster or Supplemental List Give the voter a provisional ballot. See p. 11 of the What to do if… guide for more info. dropped off voted ballot, but signed the Roster. If someone’s life may be in danger, call 911. If there is a fire or other situation that makes the polling place dangerous, ask everyone in the polling place to leave. Call the elections office on your cell phone to describe your situation. Do not use elevators, unless police or firefighters tell you to. Tell the person how to get out. Use the words “left, right, back, forward.” Say how far the distances are. Remind them not to use the elevator. Get the person’s attention by touch or eye contact. Use hand motions or handwriting to explain what is happening. Point to the safest exit, or show the person how to get out using an evacuation map. Make sure there are uncluttered, open exit routes. If someone is not able to leave, move him/her to a safer place, such as a stairwell or an office with a closing door. Tell the police or firefighters as soon as you can where this person is. If someone is in danger, and there is no safe place for them to wait, get that person out immediately. If possible try to take the person’s crutches, wheelchairs, or walkers with you. Shut down the Accuvote scanner. Follow the Accuvote Instructions for Closing on the laminated instruction sheet in Chief Bag #1. Pack the Accuvote scanner in the black Accuvote bag. Give the Deputy the number of voted ballots for the precinct from the Accuvote Results Tape to write on Line 6 of the Roster Ballot Statement. (If your polling place covers more than one precinct, the tape will show results for each precinct.) See Deputy’s Duties, Number 7 below. Sign Accuvote Results Tapes. Post one copy of the results tape on the door outside your polling place and put the other copy into the Results Tape Envelope. Put it into Envelope C. Do not post the results tape if less than 10 ballots were counted by the Accuvote machine. Instead, write the number of ballots cast on a sheet of paper and post it outside the polling place. Shut down the Automark machine. Follow the AutoMark Instructions for Closing on the laminated instruction sheet in the AutoMark case. Be sure to put the headphones, keys and power cord back into the case. Remove ballots from the ballot box, count them and give numbers of each type of ballot to Deputy for Ballot Statement. See Section H, Numbers 1-4, for instructions. Deputy’s Duties - Account for unused and spoiled ballots. Record number of voters who signed Roster. Take down the flag, outside copy of Street Index, posters and signs. Bring in the Vote Here stand-up sign. Count all unused Accuvote Ballots. Write that number on the Ballot Statement, Line 2A. Write that same number on the seal for the unused Accuvote ballots. Put the cartons of unused ballots into the black Deputy bag. Count all unused Automark ballots that are in Deputy Bag 1 (plastic bag). Write that number on the Ballot Statement, Line 2B and on the seal for Deputy Bag 1. Sign the seal and seal Deputy Bag 1. Put Deputy Bag 1 inside the black Deputy bag. Add 2A and 2B. Write the total on the Ballot Statement, Line 2. Put Envelope A into the black Deputy bag. Look at your tally sheet, and write the last number crossed off on the Ballot Statement, Line 8. The Chief will read the Accuvote Results Tape and say how many voted ballots there are for your precinct. Write that number on the Ballot Statement, Line 6. Open Door 1 of the ballot box. Remove the voted Accuvote ballots and pack them in their original carton/s. Sign the seal and seal the carton/s. Put the carton/s in the red Chief bag. Open Door 2 of the ballot box. Take out and count the following 4 types of ballots. Have your Deputy nearby to write your numbers on the Ballot Statement. Tell the Deputy how many you counted. Envelope C, on the label. Put all of these ballots in Envelope C – not with the regular voted ballots! Count any voted Automark ballots. Put all of these ballots in Envelope C.
Count the number of voted Provisional Ballots. Put all voted Provisional Ballots into Envelope C.
Sign the seal and seal Envelope C. Put it into the red Chief’s Bag. Count the all VBM ballots from the ballot box and the blue VBM box. The Deputy writes that number on the Envelope VBM label. Pack all VBM ballots into the VBM Envelope. Sign the seal and seal the VBM Envelope. Put it into the red Chief Bag. Add lines 2-6 on the Ballot Statement. Write that number on Line 7. Do not worry if your Ballot Statement numbers don’t balance. The Elections Office will recount everything. Sign the front cover of roster, then complete and sign the Certificate of Number of Voters Voting and the Certificate of Performance on the inside back cover of roster. Sign and seal Envelope B, then put it in the red Chief bag. Your red Chief bag is now packed. The Receiving Center address is on your red bag. 1Make sure your supplies are packed in the correct container. See Section I for a description of where things should go. Clean up the polling place. Turn off the lights, and lock the door when you leave. Please finish your closing duties and deliver the voted ballots and Accuvote to the Receiving Center within 1 hour after the polls close so that the public can get the results of the election as quickly as possible. Thank you for working at the polls and for a job well done! Use the laminated closing guide for Accuvote bag to make sure all items are packed. Use the laminated closing guide for Chief’s red bag to make sure all items are packed. When you recorded the ballots (explained on top of Section H), you already packed the red bag. Take the Red Bag and the Accuvote Bag to the Receiving Center right away! The address is on the ID tag inside the transparent pouch on the front of the red bag. You must bring another poll worker with you to the receiving center. After you drop off the red bag and Accuvote bag, you may have to go back to the polling place to supervise the final closing. Check with your Deputy Inspectors to see if they need your help. Use the laminated closing guide for black Deputy bag to make sure all items are packed. (Sealed) cardboard boxes (or plastic bags) with unused Accuvote ballots. Use the laminated closing guide for black ballot box to make sure all items are packed. Leave the following items inside the polling place: Black Deputy bag, black ballot box, Automark machine, voting booths, tri-fold sign board, “Vote Here” stand up sign, and BallotCall (if one was delivered to your polling place). Our movers will pick them up on Wednesday, the day after the election. Leave the following items outside the polling place: Accessibility equipment (i.e. : ramps, cones, signs, etc.) set up outside polling place. Our movers will pick them up on election night.